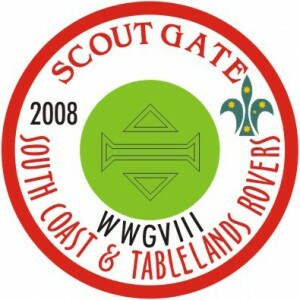 On the 15thÂ November 2008, South Coast and Tablelands Rovers gathered Scouts and Guides at Cataract Scout Park to explore the new worlds accessible through a powerful artefact â€“ the Scoutgate. Each Patrol was allocated to a specific race and released on the unsuspecting galaxy to save (or conquer) it as they desired. The key to ultimate power was to discover the location of the lost Island of Brownsea. During the game, the Scouts and Guides had to attack their opponentâ€™s home worlds whilst protecting their own, attack their rivals where possible, gather equipment and information, and explore the new worlds that were discovered. The Jungle World was an overgrown region, where hostile natives lay in wait, ready to ambush or trap all visitors as the opportunity presented itself. Certain leaders were observed to be taking entirely too much pleasure in playing this role! Cave World saw the explorers travel through an underground vault, dodging traps and attempting to discover hidden treasure caches. The Wasteland was a combination race and all-in-brawl between the explorers and the local monsters. The City was a (mostly) neutral outpost where the Scouts could buy or sell practically anything, with a totalitarian government keeping a close eye on them in the process. Those that were caught stepping out of line were severely punished. When the Patrols finally decoded the location of the Island of Brownsea, it was discovered to be defended by vicious aliens. Once these defenders were overcome, the island itself was discovered to be trapped and deadly, with a cache of hidden weapons awaiting those who were able to bypass the defences. The weekend saw Patrols take to their roles with varying degrees of success. Many raids were launched on each otherâ€™s bases â€“ and the teams quickly learned the folly of leaving their Homeworld unguarded. The Jungle world quickly became an â€œattackâ€ area, with many Patrols attempting to beat the Natives at their own game â€“ and take out each other in the process. At least 10 Patrols discovered the location of Brownsea by the end of the first day of play, but by the end of the game, only one had managed to make it all the way in (and out) safely â€“ the others fell victim to the fiendish defences. Some Patrols worked well with their new team-mates, and scored many bonus points for themselves and their allies. Others adopted a â€œlone wolfâ€ approach, dedicating the weekend to preying on as many of the opposition as possible. This yearâ€™s game had an attendance of over 150 Scouts and Guides in 29 Patrols, with a very healthy â€œtouristâ€ contingent from out-of-region groups. All were competing for the 2008 WWG trophy, and prizes of Snowgum vouchers and camping gear. When the time came to sit down and tally the scores, there were many surprises â€“ not least of which was the winning Patrol! The scores were checked, double-checked, and even triple checked, but the results remained unchanged – the winners by a clear margin (on both raw and weighted scores) were a very shocked 1stÂ Keiraville, led by Nicholas Monteleone. Holders of this yearâ€™s wooden spoon, the â€œRed Shirt awardâ€, were the 1st Batemans Bay Pancake People, who now join a very select group of recipients â€“ some of whom try (year after year) to regain that very special award. Venturer Award: Shared by Catherine Bowie (Korrahill), Charlotte Baker, and Mark Critcher (Bulli). â€œLeaderâ€™s Choiceâ€: Special mention goes to Emma Snowden of 1stÂ Warilla Scouts, who earned this award for her actions in assisting an injured Scout (from a different Patrol) on one of the bases. Special thanks go to the few, but dedicated, Venturers and Rovers who were able to assist on the weekend. Also thanks to Snowgum who were generous in their donation of items for the prizes: extra vouchers, two Traveller Sleeping bags, and a 2-man Storm Shelter hike tent.